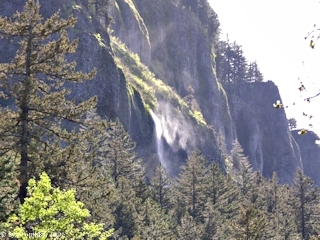 Click image to enlarge Mist Falls, Oregon, as seen from Benson State Park. 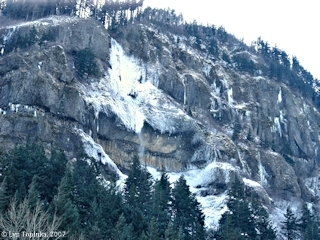 Image taken January 13, 2009. 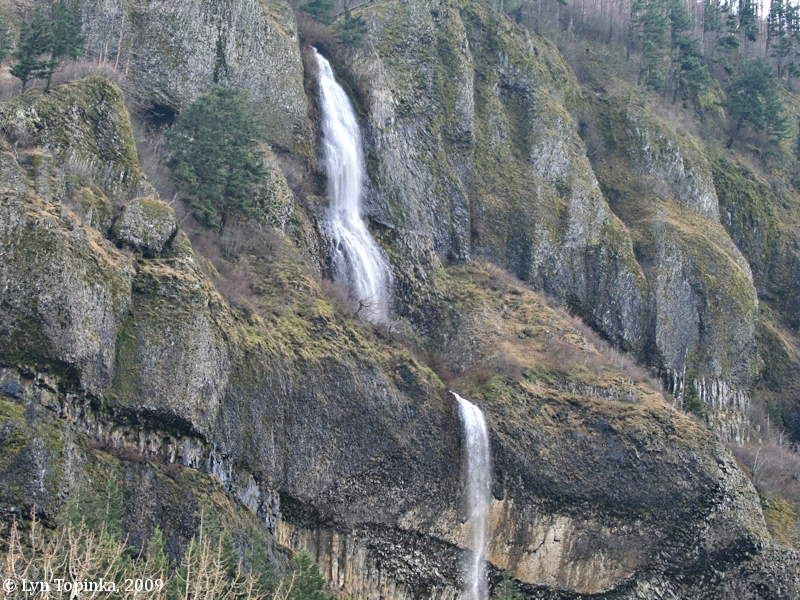 The 500-foot-high Mist Falls is the second tallest falls in the State of Oregon, with Multnomah Falls, located one mile upstream, being higher. 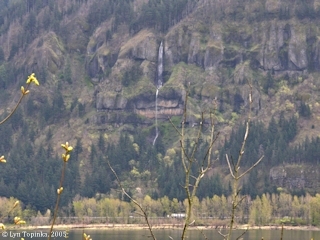 Mist Falls is located above Benson State Recreation Area at Columbia River Mile (RM) 135. Mist Falls is a 20-feet-wide tiered falls with 2 drops, and is located on Mist Creek. 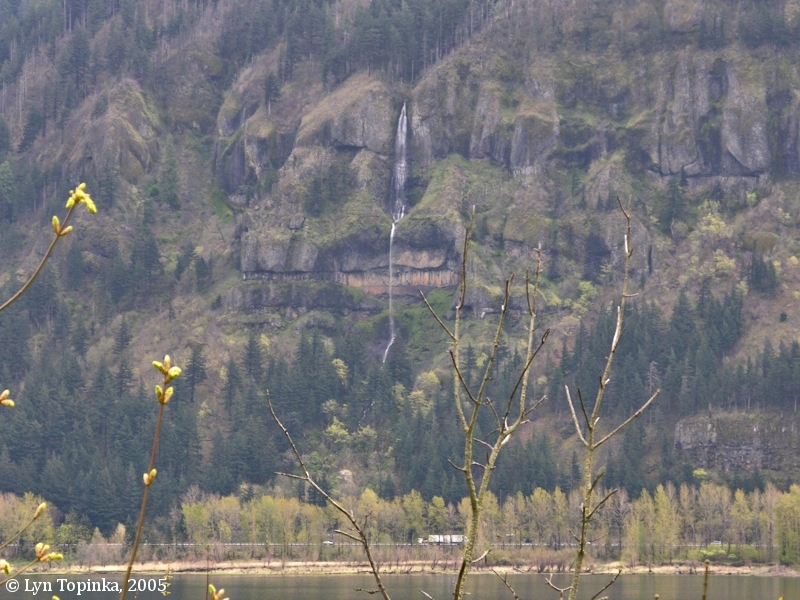 The falls is one of many falls in the Columbia River Gorge which can be seen from the Historic Columbia River Highway. Good views can be had from Benson State Recreation Area, or from the Washington side of the Columbia near Prindle. "Directly above Multnomah Lodge, Mist falls comes in a film of cloud-like spray from the high cliffs, wasting into a cloud of mist in its thousand-foot descent, and gathering its waters at the head of the talus slope to cascade down in a dash of foam to the river level." "... MIST FALLS, 159.8 m., where the water drops from a 1,200 foot escarpment were thus mentioned by Lewis and Clark: "Down from these heights frequently descend the most beautiful cascades, one of which [now Multnomah Falls] throws itself over a perpendicular rock. . . . while other smaller streams precipitate themselves from a still greater elevation, and evaporating in mist, again collect and form a second cascade before they reach the bottom of the rocks." ..."
Click image to enlarge Mist at Mist Falls. View from Benson State Recreation Area, Oregon. Image taken April 22, 2006. A cold snap and freezing weather makes for great views of frozen creeks and frozen waterfalls up and down the Columbia River Gorge. Click image to enlarge Frozen Mist Falls as seen from Benson State Recreation Area. Image taken January 15, 2007. Multnomah Lodge, also known as "Mist Lodge", was built in 1916 at the base of Mist Falls. It burned down in 1929. 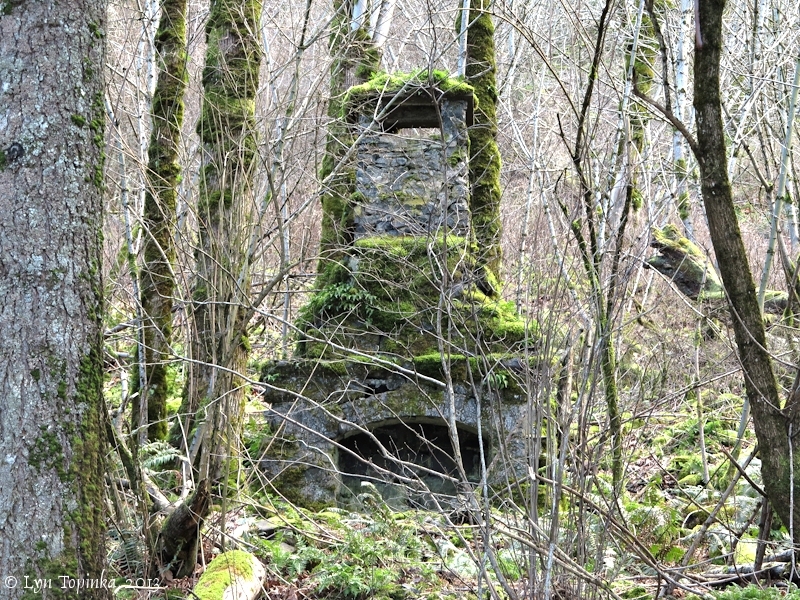 The fireplace and chimney, along with a Columbia River Highway drain cap, are still visible today. Click image to enlarge Multnomah Lodge, ILLUSTRATION, "Official Columbia Highway Tour", 1916. 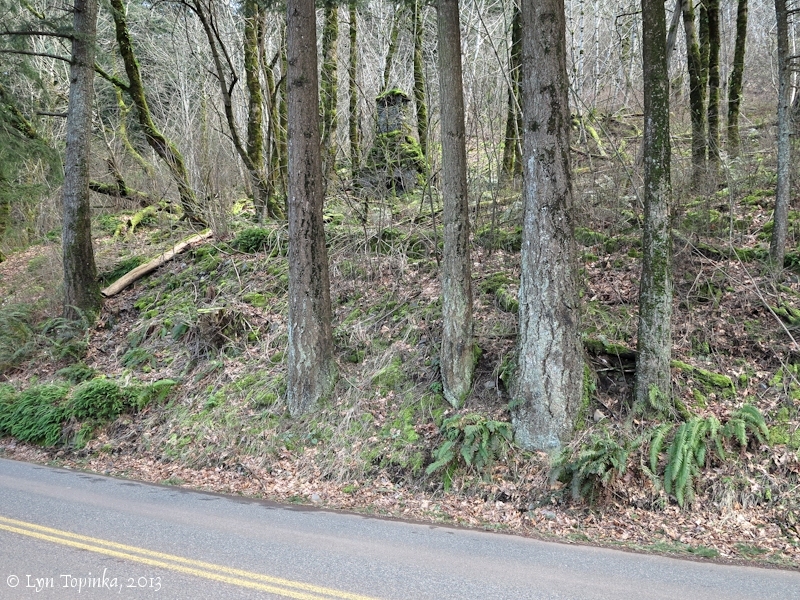 Click image to enlarge Fireplace and chimney remains, Multnomah Lodge, Mist Falls, Oregon. 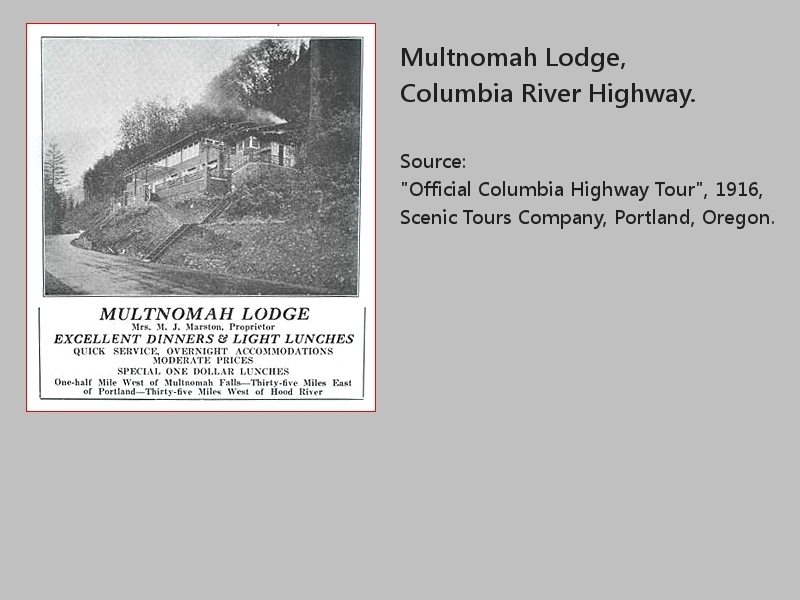 Multnomah Lodge burned in 1929. The Historic Columbia River Highway is in the foreground. Image taken February 19, 2013. 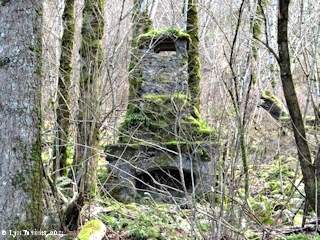 Click image to enlarge Fireplace and chimney remains, Multnomah Lodge, Mist Falls, Oregon. 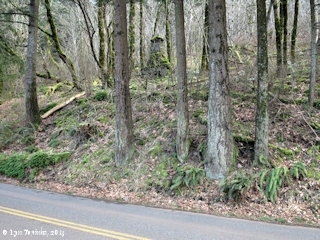 Multnomah Lodge burned in 1929. Image taken February 19, 2013. Click image to enlarge Historic Columbia River Highway drain cover, Multnomah Lodge, Mist Falls, Oregon. 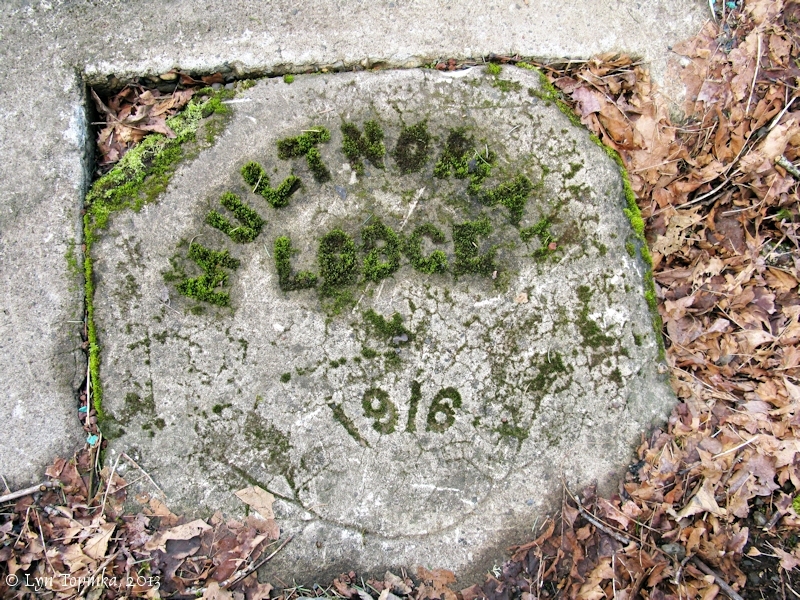 Multnomah Lodge burned in 1929. Image taken February 19, 2013. Click image to enlarge Upper Mist Falls, Oregon, as seen from Prindle, Washington. 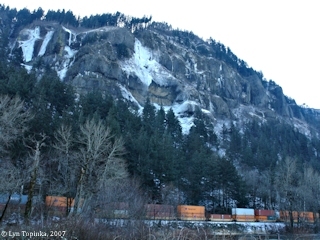 Interstate 84 is visible at the base of the falls. Image taken April 2, 2005.